Susanna Resmark is a worldwide sought-after Mezzosoprano, known for her crystal-clear diction, beauty of sound, impressive vocal range and powerful stage appearance. The Swedish Mezzosoprano can be seen regularly at the major international opera houses, including Teatro alla Scala, The Metropolitan opera, San Francisco Opera, Salzburger Festspiele, Bayerische Staatsoper München, Hamburgische Staatsoper, Deutsche Oper Berlin, Glyndebourne , Gran Teatro del Liceu, Copenhagen Opera, Stockholm Opera, Norske Opera, Teatro Verdi di Trieste, Capitole de Toulouse or New National Theatre Tokyo. On these stages she appears with roles such as MÈRE MARIE (Dialogues des Carmélites), MESCALINA (Le grand macabre), ULRICA (Un ballo in maschera), KABANICHA (Káťa Kabanová), KLYTÄMNESTRA (Elektra), ORTRUD, (Lohengrin), MS QUICKLY (Falstaff), DAME RAGONDE (Le comte Ory), AMME (Die Frau ohne Schatten), FRICKA (Das Rheingold & Die Walküre), ERDA (Siegfried), KUNDRY (Parsifal), VENUS (Tannhäuser), BRANGÄNE (Tristan und Isolde), AZUCENA (Il trovatore), EBOLI (Don Carlo), AMNERIS (Aida), JEZIBABA (Rusalka), HERODIAS (Salome), SANTUZZA(Cavalleria rusticana), LEOKADJA BEGBICK (Aufstieg und Fall der Stadt Mahagonny), and LA ZIA PRINCIPESSA (Suor Angelica) or LA ZITA (Gianni Schicchi). Susanne Resmark features on several recordings (CD/DVD) , highlighting The Metropolitan Opera’s “Le comte Ory” by Vergin Classics, in Poulenc’s “Dialogues de Carmélites” form the Bayrische Staatsoper´s with Kent Nagano (BelAir), “Elektra” with Semyon Bychkov, or three collaborations with Kasper Holten at the Royal Danish Opera under the baton of Michael Schønwandt: “Maskarade” available on DaCapo; “Tannhäuser” and “The Copenhagen Ring” both released on Decca. Throughout her career Susanne Resmark has worked with many of the world’s leading conductors including Claudio Abbado, Herbert Blomstedt, Rafael Frühbeck de Burgos, Semyon Bychkov, Valery Gergiev, Kent Nagano, Mark Elder, Maurizio Benini and Yannick Nézet-Séguin. Susanne Resmark received the coveted Birgit Nilsson Award in 2002. In 2007 she was appointed Knight of the Dannebrog by HM Queen Margrethe II of Denmark. 2018 the artist was GERTRUDE in Roméo et Juliette at the Gran Teatre del Liceu Barcelona, 3rd DAME, AZUCENA and the FALKE in Fledermaus at the Royal Opera Copenhagen. Future engagements bring her to the Royal Opera Stockholm as MÈRE MARI in Les Dialogues des Carmélites, as MRS LOVETT in Sweeney Todd to the Royal Opera Copenhagen and as HAUSHÄLTERIN in Die schweigsame Frau to the Bavarian State Opera Munich. …including secure high registers and drama. 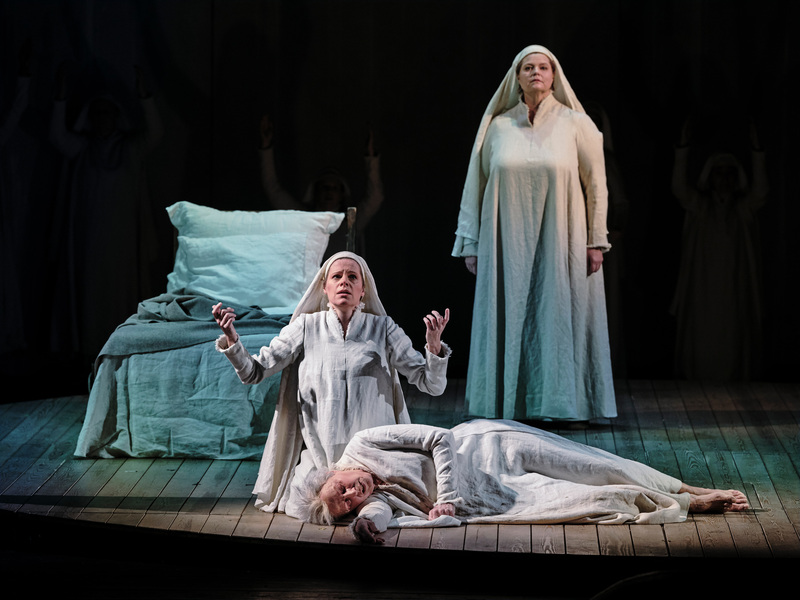 Regarding the latter, she was only excelled by Susanne Resmark’s Marie, who showed off with a vocally powerful mezzo voice, convincingly presenting the most pugnacious among the nuns. … and the swedish Susanne Resmark (Gertrude) portrays her role with temper and theatrical efficiency. The contralto Susanne Resmark was convincing as Adèle’s stentorian companion Ragonde, showing off the bell-like resonance of her low register. …and Susanne Resmark, a warm, dark-hued Swedish soprano, in her Met debut as Ragonde, Adèle’s attendant. Susanne Resmark is a very decent Mistress Quickly, nicely acted and vocally assured. something awe inspiring about the true contralto voice that creates a special excitement and there are certain contralto roles that when sung well augment the appeal of an opera immeasurably – Mistress Quicly, Erda, Gaia, Ulrica fall into this camp. Resmakr has some of the elements and certainly has a very nice voice – this is a talented dramatic mezzo managing an alto voice. …and Susanne Resmark’s bright-eyed, booming Mistress Quickly are right at the top of the class. Susanne Resmark revealing an opulent mezzo-soprano voice as well as excellent comic timing as Mistress Quickly. Susanne Resmark does a fantastic job, with a great line in matronly hauteur and quizzical glances, while breezing through the vocal requirements with deceptive ease.